The valance and panels to go with them are good quality and Antique Gold is just gorgeous. 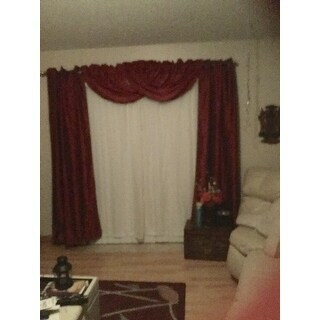 I would highly recommend buying these valances with the curtain panels. The elegant silk-look of the All Seasons waterfall valance will add a decadent touch to your living room, dining room, or bedroom. The polyester blend fabric is machine washable, and rod pocket easily slides onto your existing curtain rod. To achieve the look in the photo use four waterfall valances. To achieve the look in the photo, use four waterfall valances. I paid *** for 1 valance. I was stupid enough to think that 1 meant a pair. This is made in China 100% polyester and looks it. I would have thought *** was too much for 2 let alone 1. Now I get to pay return fees, take time to mail it, etc. I can't imagine anyone rating this more than one star. Huge rip off. Starting to tire of Overstock's growing inventory of lousy products. Used to be quite good. These curtains add a nice elegant touch to my living room . The water fall Valance is what makes the curtains. Only thing is the valance did not fall or look just like it is shown on the picture. Curtains do block sunlight. 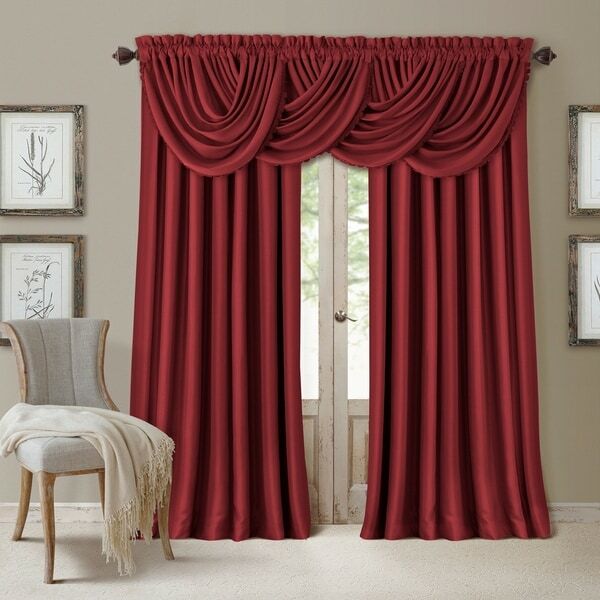 I bought four of these valances, in red. They look very nice in our dining room. Purchased the set (Together with the Elrene All Seasons Blackout Curtain Panel). Beautiful combination and and adds a classy look to the living area. Definitely recommend it to anyone looking for elegance. These curtains are gorgeous. They are heavy in weight and do a fantastic job as blackout panels. The effect shown is achieved with 4 valances. The results are nothing less than stunning! I have received numerous compliments on them. You will not be disappointed. Loved this Waterfall Valance, easy to put up. I only wished it had dimension or widths they reach. I purchased 3 on my first order but then had to buy another 3 to get the look in this picture. These valances are really elegant. They hang well and look lovely in my living room. I'm glad I purchased them. The quality is excellent and looks very expensive. I love these valances, the way they all tie into each other. However, I did not like the way they look with 6 pieces compared to 4. The color states gold, however the color is actually more like a green, but.... The curtains were thin and not of thick quality for the asking price. I thought when ordering it had the curtains as well website really didnt specify properly!! Color goes food with my color scheme!! Look as described. The Valance makes for a nice touch to the picture window and the entire family room. I love the look. Gave double windows, had to purchase 4. Beautiful color and elegant look. Great set. Very neutral patter. I’ve furnished many guest rooms and this is just one of those that are really a great fit. Great quality for the price. Great for accenting room windows. Beautiful! Will be ordering another pair! Adds a look of elegance to my home! "How many pieces would I need to cover a window 108 inch wide with the waterfall look shown"
We recommend purchasing 4-5 valances to cover a 108” wide window. "I have three windows at the back of my house each measure about 63" in width, how many for each window or would I do it as one window all together." We would recommend purchasing three window valances for each 63-inch window. "I have two windows 36" wide and I was thinking one panel with two valances for each window. Would that work?" We would recommend two panels for your window for the desired look. One panel is more for a 29-inch wide window. Three panels would look well over 40-48-inch windows. "Does this come in the antique gold like the panel?" Unfortunately, the gold option is not currently available. "What formula do you use to figure out how many swags to get? 3 x the width of window? My window is 35" wide from outside trim to outside trim. 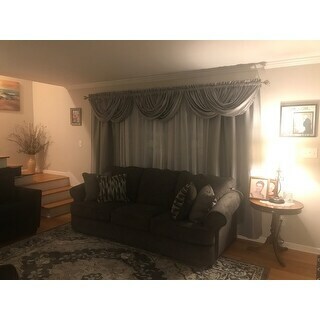 How many of these waterfall valance would i need? Thanks!" "One answer said the valance was 36" wide and the next said it was 52" wide? it is standard practice when giving demension to list width first -- but I am afraid to assume that given your answers? what is the correct width ? and how many do you recommend for a 120" window??" This measures approximately 52 inches wide x 36 inches long. "How many panels are required for a 64" window?" We would recommend approximately 6 to 8 to achieve the look in the lifestyle image. Best Valances for Living Room Windows from Overstock.com. Our guides provide customers with information about the best valances for living room windows. How to Drape a Scarf Valance from Overstock.com. Our guides provide customers with information about how to drape a scarf valance. Tips on Decorating with Window Valances from Overstock.com. Our guides provide customers with tips on decorating with window valances.